Poetry spanning the life of the author. She expresses her wry and witty outlook on a variety of subjects, including her chosen career as a stay-at-home mom and homemaker in the Shenandoah Valley of Virginia. Especially sensitive section on Parkinson's Disease. College, love, marriage, motherhood, illness, resolution . . . beads on a silken strand that make up the Moments of My Life of poet Jacqueline S. Moore. Originally conceived as a book about Parkinson's, the degenerative disease that struck the author in 1984, it soon became apparent that it should be much more. Although Parkinson's can be neither ignored nor denied, it is not the most important aspect of Jackie Moore's life. Moore, trained as a scientist, lives and observes in a world of God, people, and nature. Her tender, witty, wry, and intuitive comments on large and small aspects of life compel the reader forward. Moments of My Life is more than a memoir. It is commentary at the elemental level where genuine lives are lived. Jackie began expressing her thoughts through poetry as a New Jersey teenager in the 1940s. Her experiences, revelations, disappointments, and triumphs all find voice in her expanding body of work through the turbulent 1960s and 1970s right up to the present day. All of the usual and some of the unusual have taken place in the Moments of My Life of this mother of three daughters and two sons. Birth and death are normal; Parkinson's Disease was an unexpected challenge. 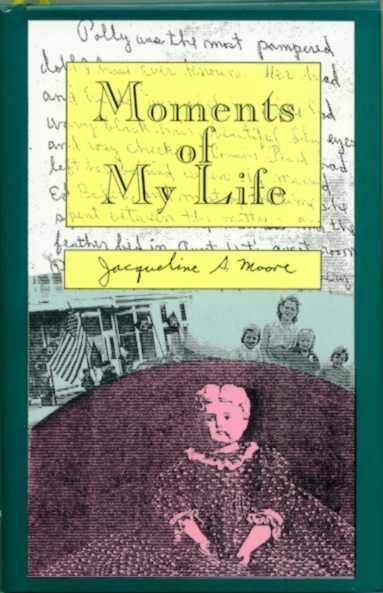 Although this is her first book, Jacqueline Moore's work has previously received recognition and appeared in several publications, including Showcase, the magazine of the Shenandoah Valley Writers' Guild and Loft Press's Poetry from the Valley of Virginia, 1996 and 1998 editions. You will find yourself turning page after page to read just one more poem from this intelligent and inspirational volume. it's an effort to go. My time has no value. because homemaking's no valid career. because I was working for pay! Have all the foxes lost their tails?